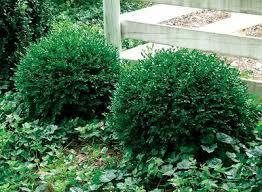 Chicagoland Green is a fine textured evergreen shrub that tolerates pruning and shearing well. It is a favorite to be used as a border or hedge. Boxwood requires well-drained soil and prefers shading and wind protection in winter, if grown on an exposed site. This Boxwood tolerates some drought and will grow in dry soil but prefers well-drained, loamy, sandy or clay soils with a pH of acidic to slightly alkaline. Chicagoland Green is a medium sized shrub and known for its cold hardiness and good winter color. It grows with a uniform, oval, rounded growth habit and will reach 3′ tall by 5′ wide in approximately 15 years.